Despite the persistent rainfall in the early afternoon – the winds delivered, allowing for a timely start for the 22 boats participating in yesterday’s Twilight Series III. Our fortnightly club series welcomes new entrants Emmanuel II, who were racing for the first time under the firm stewardship of skipper Desmond Wong. Looking forward to seeing more of her in future races! In the IRC Class, nearly the entire fleet of IRC yachts in CSC took part, sans Simba. Invictus bounced back from a dismal Sunday Series performance last week to notch a bullet. Waka Tere returned to club racing after a long break, as skipper Kurt Metzger sailed her single-handed to a 2nd place finish. Born in Fire continue to produce consistently good results, rounding up the podium finishers in 3rd. 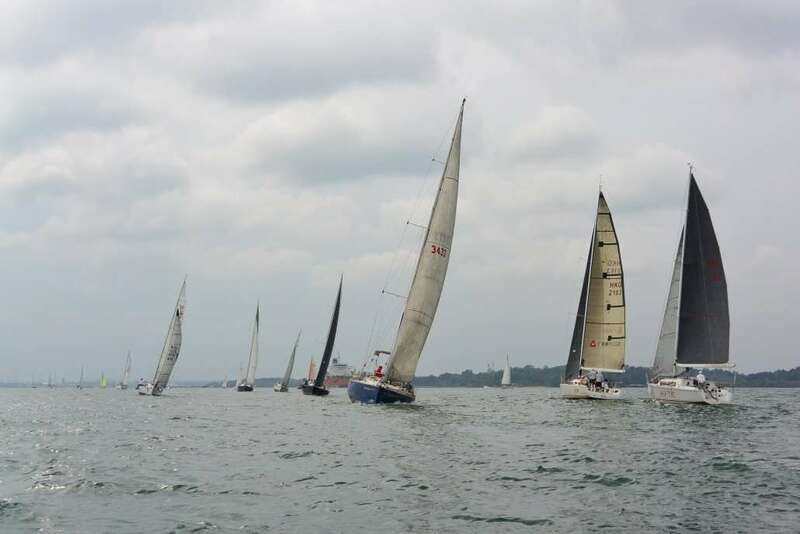 With a total of 9 boats participating, the PY Class was the largest fleet on the course, but also the fleet that struggled the most with the challenging conditions. Only 2 boats finished within the time limit of 2hrs 30mins. The mighty Sangaree fended off stiff competition from New Blue Eyes to clinch victory, as the latter settled for 2nd place after corrected time. Minx was the best of the rest, as skipper Lucas van Maarschalkerweerd’s solo efforts paid off – securing him a 3rd in his class. It was another case of impressive solo-sailing in the Cruising Multihull Class, as Graham Horn skippered Jaza Too to a narrow win over Gary Curti’s Miss Visayan. Baloo found it difficult to sail at the optimum boat speed and wind angles, eventually surrendering 3rd place to Cicak. A solo sailor in every class! Scott McCook was the Beach Catamaran Class’s contribution to the Singles Club, sailing the Viper F16 to yet another victory, despite her poor start. Nigel Signal’s Stray Catz was a close 2nd. Kudos to Persian Cat for persevering and finishing the race just within the time limit. Thank you all for another excellent turn out! See you next Sunday for Race 3 of our Sunday Series.